This is what it's like fixing fence in canyon pastures. So here we go again, fixing fences to turn cattle out for summer grazing. Once again I'm reminded as to why this lease was easy to come by. No one wants the hassle of fixing these awful, old fences in these steep wooded canyons! Except for us, you see we are trying to get a start, and we'll take anything we can. So it was a cold wet day when the Ranch Hand and I set off to fix fence in a thousand acre canyon pasture. He had the Little Ranch Hand on the 4-wheeler and they'd check and fix fence where they could drive to. They'd drop me off to hike the canyons and pick me up somewhere down the line. I stumbled upon this heap of a mess from years back. I love cool old stuff and started searching through it for old bottles or anything neat. Here are a couple of keepers I found. I'll have to go back for them later. Then out of the blue we see some new fence coming out of the trees. Could this possibly be some new fence the owner had put in?!!? It was, and it stretched for a couple of miles. What joy filled our souls when we followed it and followed it, just happy as can be. It made our day! So we stopped and had a piece of candy to celebrate! Soon we found where the new fence stopped and the old fence continued. Happy for the new, we finished fixing the rest of the old fence. It was a long day, but now we can sleep at night knowing our cows are where they should be. After a full day of fixing fence the next day we set off to help a neighbor work his cattle. First we put up a make shift temporary corral so we could brand and vaccinate his cows and calves. The panels were old and heavy and it took all morning. When we went to brand the calves his electric iron wouldn't work. We later found out the power had been out for a time and you wouldn't guess what the culprit was... A bird had dropped a rattle snake on the power lines, which fried him and knocked the power out. We ended up vaccinating the cows and calves, went to town to get our kids from school and came back to brand the calves. They'd been let out and we had a heck of a time getting them back in. 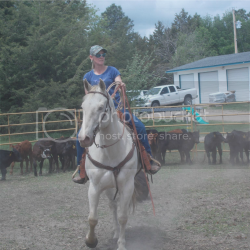 Of course I am not the best roper and it took us forever to brand 2 calves, and 3 ended up getting away. We found ourselves in a mess when calves and cows alike started going through fences. It was a disaster. This was the only good thing from the day: Cute Kids! Saturday came and it was our big day to move three bunches of cattle. One group we moved in the morning, down to the canyon. It ended up being a mess, with cows and calves not waiting to be paired up at the end. If they don't pair up calves end up heading home, cows end up heading home, tearing apart fences and whatever else to get back to the last place they saw their calves. So you get them to the pasture, show them where the water is and then hold them in a group. Slowly you start letting out cows that have their calves with them. Pretty soon they are all paired up, (cows with their own calves). This is not easily done in a heavily wooded canyon with only two adults and one child. We got it in the end, only to come home to the bulls being out. Sigh. We got them back in, had some lunch and started the second herd heading north. They moved much better and we got them to summer pastures without a single problem. Hooray! Next we moved the group of heifers we will artificially inseminate in a few weeks. They are on the home place in our West pasture for now. Here are a couple pictures from the long day of moving cattle. Ranching is not for the faint of heart. It's not a nine to five job. There are no vacation days or weekends off. Cows don't know the difference between Sunday or Christmas. It's work, tiring work sometimes. But it has it's rewards just like anything else worthwhile. The things you work the hardest for end up meaning the most to you. The next time you hear an animal rights activist going off about how ranchers don't care about their animals, you shut them down. Don't listen, because it's not true. We are not in the minority here. 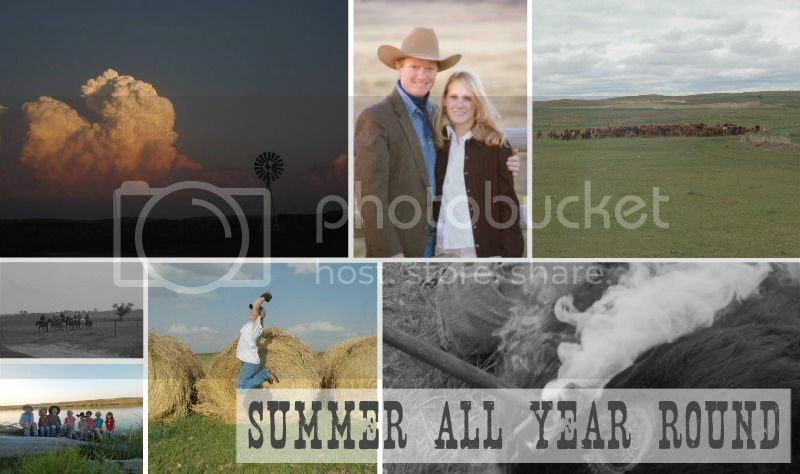 Most ranchers love their animals and the land. They dedicate their lives to it because it's a lifestyle, not a job.